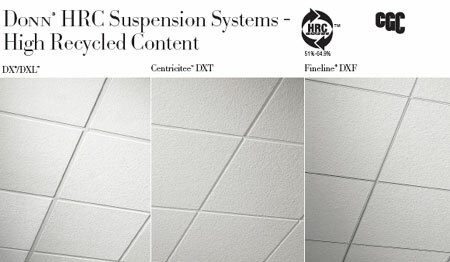 Donn Brand DX/DXL, DXT Centricitee & DXF Fineline are now available in HRC (High Recycled Content)! LEED (Leadership in Environmental & Energy Design) is a third-party certification program and an internationally accepted benchmark for the design, construction and operation of high performance green buildings. It is a rating system that encourages and accelerates global adoption of sustainable green building and development practices through the creation and implementation of universally understood and accepted tools and performance criteria. For more information on LEED Rating Systems, Registration & Certification & Frequently Asked Questions, see the Canada Green Building Council's Website. It's got everything you need to know about LEED! In order to achieve LEED credits, you're project as a whole must meet certain requirements, see the USG Sustainability Table to find out how using CGC's products on your Project can assist you in achieving credits in the MR4 - Recycled Content, MR5 - Regional Materials & MR6 - Rapidly Renewing Content. One of the more commonly occurring volatile organic compounds (VOCs) is formaldehyde, a colorless and pungent gas. Formaldehyde is an important industrial chemical used to make other chemicals, building materials, and household products. But it may also be released into the air, or off-gassed, by some products. Formaldehyde can cause extreme discomfort and adverse reactions, including watery eyes, burning sensations in the eyes and throat, nausea, asthma attacks, wheezing, coughing, fatigue, skin rash, and severe allergic reactions. USG offers the widest selection of standard ceilings that satisfy stringent IEQ requirements and guidelines related to VOC and formaldehyde emissions. More than 20 ceiling families deliver zero- or low-emissions performance. The level of formaldehyde in USG's low-emissions ceilings is still far below the level considered an exposure risk. Check out USG's Sustainable Ceiling Resource Centre to learn more about Formaldehyde Performance, Antimicrobial Protection & other factors which affect Indoor Environmental Quality.